MST3K Returns To TV — Kind Of— Thanks To National Geographic?! Good news! Weird news! This news is both good and weird! 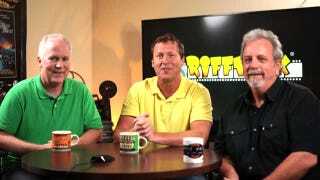 Mike Nelson, Kevin Mutphy and Bill Corbett — former stars of Mystery Science Theater 3000 and now Rifftrax — are making three episodes of a riff-based show for the National Geographic channel! Now it won't be titled Mystery Science Theater 3000, because this definitely is a Rifftrax project (and someone else owns the rights to the show name). But it's the closest we've come to a show like it since the original series went off the air in 1999. Zap2It says three episodes of something being riffed will air on April 1st — will it be old NatGeo documentaries? Classic nature educational shorts? Hilariously outdated examinations of foreign cultures? Doesn't matter. Hell, they could watch an aquarium for two hours and I'd be there.